Digital storytelling is a powerful way to connect young learners to reading, writing, and digital literacy. While students in the primary grades may be more likely to watch stories than read and write their own, today’s digital tools make it easy for these emerging writers to create and publish their own stories. Digital storytelling tools provide opportunities for primary learners to begin communicating their ideas by simply adding pictures and recording their narration to describe what they’ve drawn, providing an opportunity to practice retelling before they begin writing. Digital storytelling relies on showing as much as telling, exemplifying that 21st-century literacy is more than just words on paper. For students who aren’t yet strong readers or confident speakers, or are new to the English language, creating digital stories provides an authentic opportunity to practice fluency. Digital stories are meant to be shown and shared; if you give your young learners headset microphones, they can record, listen, and rerecord until they are comfortable with their fluency and ready to incorporate their narration into the digital story. The process of developing a digital story provides opportunities for students at all competency levels to develop and improve their writing craft. Many digital storytelling tools include a storyboard view of the pages in a project, helping students see how their writing is organized and providing an easy way to change the order events and ideas. Students can also look at the visual details in the pictures they have added to their stories and then enhance the story with additional descriptive writing. Digital storytelling provides a compelling need to read and listen carefully and to write and edit effectively. Writing, adding images, writing more, rearranging the order of a project, and changing specific details helps students see that effective storytelling requires time, reflection, and editing. Creating digital stories, like the ones they are watching on YouTube and Netflix, help young learners see how the skills they are learning in school connect to the world around them. “Why do we have to do this?” isn’t heard that often in a room of eager primary learners, but crafting digital stories firmly answers this question and establishes that what is learned in school is relevant to their world outside of it. What can primary students create? While digital storytelling requires skill in narrative writing, it isn’t limited to this form of writing. In fact, the most powerful writing often combines informational, narrative, and opinion writing to inform and entertain, to raise awareness, or to change behavior. Many young students love to tell stories, and some of them are even interested in writing them down. But for others, getting the ideas in their head down onto paper is a struggle. Because effective digital stories, show, not tell; images and sounds are as integral to effective storytelling as the text itself, easing the stress many young students feel when asked to write. You might choose to have reluctant writers brainstorm ideas and begin “writing” by finding and adding them to their story. Tools for digital storytelling, like Wixie, make it easy for students to change the order of pages and then use the recording feature to narrate their story without having to write at all. You could also have them record their ideas as a first draft, find a parent or assistant to type the words into a word processing document and then have them work to edit the printed version before recording again. Emerging readers love pattern stories because they “know” what is coming next and can “read” the story without having to know how to read the words. You can also use patterns to build the confidence of your emerging writers by asking them to add just a few words to complete a pattern for a class adaption of your favorite story. After reading your favorite pattern story, use its pattern, or develop your own version, and ask your students to complete it. If the pattern requires just one or two words to complete, students may be able to type on their own or with you at a station or interactive white board. Have students use paint and imaging tools to add supporting illustrations. There are many great children’s literature titles that are easy and fun to adapt. Many digital publishing tools, like Wixie, even let you create your own template that makes it easy for students to begin creating their page as well as tools that make it easy to collect, combine, and share their work as a class book. While not a traditional narrative, how-to instructions make for a great digital storytelling project. How-to writing helps teach students the importance of organization and sequencing. Using digital tools to create a short series of pages that each contain a simple sentence or two along with supporting visuals and illustrations, allows emerging writers to create products that effectively communicate an idea or process. Many young students have already used a YouTube video to learn how to make glitter slime, do simple card tricks, or complete holiday crafts. Some of them even know how to search and find a video on their own when they want to learn something. 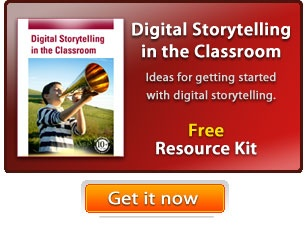 Developing and publishing their own how-to digital stories connects the work students are doing in school to the world they encounter outside of it. Everyone likes to be an expert and many young students have high-interest and high-expertise in a specific area. Create a learning culture that shows students you expect them to share their expertise with other learners, by challenging them to create informational texts that teach others about the topics they are passionate about. When you ask young students to develop informational texts, the added benefit is that you end up with informational texts written at the level of your learners. While the Web contains a wealth of information on just about any topic, the content and reading level of the information is often way above the ability of primary students. If you share student work online, or export as PDFs or eBooks, you let students know that their work is important. Your digital library can be full of literature and informational texts that were written and published by your students! Stories inspire action. Use digital storytelling projects like opinion pieces or public service announcements to let learners know that their writing and publishing can change the world. Students use their growing writing and digital communication skills to raise awareness and educate others about issues for which they are passionate. When several of the people mentioned in the stories cried after viewing them, students saw the power that their words and stories could have. Let your emerging writers know you believe in them! Not only are emerging writers and primary learners able to create digital stories, the process of creating them develops strong foundations for digital-age communication. Digital storytelling also provides a powerful opportunity for students to practice authentic digital literacy skills through work that is shared with the world beyond the classroom.